For other uses, see Stork (disambiguation). "Storks" redirects here. For movie, see Storks (film). Storks are large, long-legged, long-necked wading birds with long, stout bills. They belong to the family called Ciconiidae, and make up the order Ciconiiformes. Ciconiiformes previously included a number of other families, such as herons and ibises, but those families have been moved to other orders. Storks dwell in many regions and tend to live in drier habitats than the closely related herons, spoonbills and ibises; they also lack the powder down that those groups use to clean off fish slime. Bill-clattering is an important mode of communication at the nest. Many species are migratory. Most storks eat frogs, fish, insects, earthworms, small birds and small mammals. There are nineteen living species of storks in six genera. Storks tend to use soaring, gliding flight, which conserves energy. Soaring requires thermal air currents. Ottomar Anschütz’s famous 1884 album of photographs of storks inspired the design of Otto Lilienthal's experimental gliders of the late nineteenth century. Storks are heavy, with wide wingspans: the marabou stork, with a wingspan of 3.2 m (10 ft) and weight up to 8 kg (18 lb), joins the Andean condor in having the widest wingspan of all living land birds. Their nests are often very large and may be used for many years. Some nests have been known to grow to over two metres (six feet) in diameter and about three metres (ten feet) in depth. Storks were once thought to be monogamous, but this is only partially true. They may change mates after migrations, and may migrate without a mate. Storks’ size, serial monogamy, and faithfulness to an established nesting site contribute to their prominence in mythology and culture. Storks are large to very large waterbirds. They range in size from the marabou, which stands 152 cm (60 in) tall and can weigh 8.9 kg (20 lb), to the Abdim's stork, which is only 75 cm (30 in) high and only weighs 1.3 kg (2.9 lb). Their shape is superficially similar to the herons, with long legs and necks, but they are heavier-set. There is some sexual dimorphism (differences between males and females) in size, with males being up to 15% bigger than females in some species (for example the saddle-billed stork), but almost no difference in appearance. The only difference is in the colour of the iris of the two species in the genus Ephippiorhynchus. The bills of the storks are large to very large, and vary considerably between the genera. The shape of the bills is linked to the diet of the different species. The large bills of the Ciconia storks are the least specialised. Larger are the massive and slightly upturned bills of the Ephippiorhynchus and the jabiru. These have evolved to hunt for fish in shallow water. Larger still are the massive daggers of the two adjutants and marabou (Leptoptilos), which are used to feed on carrion and in defence against other scavengers, as well as for taking other prey. The long, ibis-like downcurved bills of the Mycteria storks have sensitive tips that allow them to detect prey by touch (tactilocation) where cloudy conditions would not allow them to see it. The most specialised bills of any storks are those of the two openbills (Anastomus. ), which as their name suggested is open in the middle when their bill is closed. These bills have evolved to help openbills feed on their only prey item, aquatic snails. Although it is sometimes reported that storks lack syrinxes and are mute, they do have syrinxes, and are capable of making some sounds, although they do not do so often. The syrinxes of the storks are "variably degenerate" however, and the syringeal membranes of some species are found between tracheal rings or cartilage, an unusual arrangement shared with the ovenbirds. The storks have a nearly cosmopolitan distribution, being absent from the poles, most of North America and large parts of Australia, The centres of stork diversity are in tropical Asia and sub-Saharan Africa, with eight and six breeding species respectively. Just three species are present in the New World: wood stork, maguari stork and jabiru, which is the tallest flying bird of the Americas. Two species, white and black stork, reach Europe and western temperate Asia, while one species, Oriental stork, reaches temperate areas of eastern Asia, and one species, black-necked stork, is found in Australasia. Storks are more diverse and common in the tropics, and the species that live in temperate climates for the most part migrate to avoid the worst of winter. They are fairly diverse in their habitat requirements. Some species, particularly the Mycteria "wood storks" and Anastomus openbills, are highly dependent on water and aquatic prey, but many other species are far less dependent on this habitat type, although they will frequently make use of it. Species like the marabou and Abdim's stork will frequently be found foraging in open grasslands of savannah. Preferred habitats include flooded grasslands, light woodland, marshes and paddyfields, wet meadows, river backwaters and ponds. Many species will select shallow pools, particularly when lakes or rivers are drying out, as they concentrate prey and make it harder for prey to escape. Less typical habitats include the dense temperate forests used by European black storks, or the rainforest habitat sought by Storm's stork in South East Asia. They generally avoid marine habitats, with the exception of the lesser adjutant, milky stork and wood stork, all of which forage in mangroves, lagoons and estuarine mudflats. A number of species have adapted to highly modified human habitats, either for foraging or breeding. In the absence of persecution several species breed close to people, and species such as the marabou and white stork will feed at landfill sites. The storks vary in their tendency towards migration. Temperate species like the white stork, black stork and Oriental stork undertake long annual migrations in the winter. The routes taken by these species have developed to avoid long distance travel across water, and from Europe this usually means flying across the Straits of Gibraltar or east across the Bosphorus and through Israel and the Sinai. Studies of young birds denied the chance to travel with others of their species have shown that these routes are at least partially learnt, rather than being innate as they are in passerine migrants. Migrating black storks are split between those that make stopovers on the migration between Europe and their wintering grounds in Africa, and those that don't. The Abdim's stork is another migrant, albeit one that migrates within the tropics. It breeds in northern Africa, from Senegal to the Red Sea, during the wet season, and then migrates to Southern Africa. Many species that aren't regular migrants will still make smaller movements if circumstances require it; others may migrate over part of their range. This can also include regular commutes from nesting sites to feeding areas. Wood storks have been observed feeding 130 km (81 mi) from their breeding colony. The storks are carnivorous, taking a range of reptiles, small mammals, insects, fish, amphibians and other small invertebrates. Any plant material consumed is usually by accident. Mycteria storks are specialists in feeding on aquatic vertebrates, particularly when prey in concentrated by lowering water levels or flooding into shallows. On marine mudflats and mangrove swamps in Sumatra milky storks feed on mudskippers, probing the burrow with the bill and even the whole head into the mud. The characteristic feeding method involves standing or walking in shallow water and holding the bill submerged in the water. When contact is made with prey the bill reflexively snaps shut in 25 milliseconds, one of the fastest reactions known in any vertebrate. The reaction is able to distinguish between prey items and inanimate objects like branches, although the exact mechanism is unknown. Openbills are specialists in freshwater molluscs, particularly apple snails. They feed in small groups, sometimes African openbills ride on the backs of hippos while foraging. Having caught a snail it will return to land or at least to the shallows to eat it. The fine tip of the bill of the openbills is used to open the snail, and the saliva has a narcotic effect, which causes the snail to relax and simplifies the process of extraction. The other genera of storks are more generalised. Ciconia storks are very generalised in their diets, although Abdim's stork is something of a specialist in feeding in large flocks on swarms of locusts and at wildfires, although other storks will opportunistically feed in this way if the opportunity arises. This is why white storks and Abdim's storks are known as "grasshopper birds". The foraging method used by the generalists is to stalk or walk across grassland or shallow water, watching for prey. The storks range from being solitary breeders through loose breeding associations to fully colonial. The jabiru, Ephippiorhynchus storks and several species of Ciconia are entirely solitary when breeding. In contrast the Mycteria storks, Abdim's stork, openbills and Leptoptilos storks all breed in colonies which can range from a couple of pairs to thousands. Many of these species breed in colonies with other waterbirds, which can include other species of storks, herons and egrets, pelicans, cormorants and ibises. White storks, Oriental storks and Maguari storks are all loosely colonial, and may breed in nests that are within visual range of others of the same species, but have little to do with one another. They also may nest solitarily, and the reasons why they choose to nest together or apart are not understood. A DNA study found that the families Ardeidae, Balaenicipitidae, Scopidae and the Threskiornithidae belong to the Pelecaniformes. This would make Ciconiidae the only group. Storks were distinct and possibly widespread by the Oligocene. Like most families of aquatic birds, storks seem to have arisen in the Palaeogene, maybe 40–50 million years ago (mya). For the fossil record of living genera, documented since the Middle Miocene (about 15 mya) at least in some cases, see the genus articles. Though some storks are highly threatened, no species or subspecies are known to have gone extinct in historic times. A Ciconia bone found in a rock shelter on the island of Réunion was probably of a bird taken there as food by early settlers; no known account mentions the presence of storks on the Mascarene Islands. The fossil genera Eociconia (Middle Eocene of China) and Ciconiopsis (Deseado Early Oligocene of Patagonia, Argentina) are often tentatively placed with this family. A "ciconiiform" fossil fragment from the Touro Passo Formation found at Arroio Touro Passo (Rio Grande do Sul, Brazil) might be of the living wood stork M. americana; it is at most of Late Pleistocene age, a few 10,000s of years. The Modern English word can be traced back to Proto-Germanic *sturkaz. Nearly every Germanic language has a descendant of this proto-language word to indicate the (white) stork. Related names also occur in Latvian, stārķis, and some Slavic languages, e.g. štorklja in Slovenian and “щъркел” [shtŭrkel] in Bulgarian, originating as Germanic loanwords. According to the New Shorter Oxford English Dictionary, the Germanic root is probably related to the modern English "stark", in reference to the stiff or rigid posture of a European species, the white stork. A non-Germanic word linked to it may be Greek torgos ("vulture"). In some West Germanic languages cognate words of a different etymology exist, e.g. ooievaar in Dutch. They originate from *uda-faro, uda being related to water meaning something like swamp or moist area and faro being related to fare; so *uda-faro is something like he who walks in the swamp. In later times this name got reanalysed as *ōdaboro, ōda "fortune, wealth" + boro "bearer" meaning he who brings wealth adding to the myth of storks as maintainers of welfare and bringers of children. In Estonian, "stork" is toonekurg, which is derived from toonela (underworld in Estonian folklore) + kurg (crane). At the times storks were named, the now-rare black stork was probably the more common species. Storks were traditionally named by parents in early Protestant America, when they didn't want to explain to toddlers where babies came from. ^ a b Brands, Sheila (14 August 2008). "Systema Naturae 2000 / Classification, Class Aves". Project: The Taxonomicon. Retrieved 11 June 2012. ^ "Anastomus lamelligerus subsp. lamelligerus". www.gbif.org. ^ a b c d e f g h i j k l m del Hoyo, J. Elliott, A. & Sargatal, J. (1992). Handbook of the Birds of the World. Volume 1: Ostrich to Ducks. Lynx Edicions. ISBN 84-87334-10-5. ^ Coulter, Malcolm C.; Bryan, A. Lawrence (1 January 1993). "Foraging Ecology of Wood Storks (Mycteria americana) in East-Central Georgia I. Characteristics of Foraging Sites". Colonial Waterbirds. 16 (1): 59–70. doi:10.2307/1521557. JSTOR 1521557. ^ Kahl, M. P. (January 1971). "Food and feeding behavior of Openbill Storks". Journal of Ornithology. 112 (1): 21–35. doi:10.1007/BF01644077. ^ Spring Alive. "A bird without voice". Retrieved 7 March 2017. ^ a b Griffiths, Carole S. (October 1994). "Monophyly of the Falconiformes Based on Syringeal Morphology". The Auk. 111 (4): 787–805. doi:10.2307/4088811. JSTOR 4088811. ^ Casey, Richard M.; Gaunt, Abbot S. (September 1985). "Theoretical models of the avian syrinx". Journal of Theoretical Biology. 116 (1): 45–64. doi:10.1016/S0022-5193(85)80130-2. ^ Tortosa, F. S.; Caballero, J. M.; Reyes-López, J. (March 2002). "Effect of Rubbish Dumps on Breeding Success in the White Stork in Southern Spain". Waterbirds. 25 (1): 39–43. doi:10.1675/1524-4695(2002)025[0039:EORDOB]2.0.CO;2. ^ Chernetsov, N.; Berthold, P.; Querner, U. (22 February 2004). "Migratory orientation of first-year white storks (Ciconia ciconia): inherited information and social interactions". Journal of Experimental Biology. 207 (6): 937–943. doi:10.1242/jeb.00853. ^ Chevallier, D.; Le Maho, Y.; Brossault, P.; Baillon, F.; Massemin, S. (5 June 2010). "The use of stopover sites by Black Storks (Ciconia nigra) migrating between West Europe and West Africa as revealed by satellite telemetry". Journal of Ornithology. 152 (1): 1–13. doi:10.1007/s10336-010-0536-6. ^ Adjakpa, Jacques Boco (January 2000). "The breeding biology of Abdim's Stork in the far north of Benin". Ostrich. 71 (1–2): 61–63. doi:10.1080/00306525.2000.9639869. ^ Kahl, M. P.; Peacock, L. J. (3 August 1963). "The Bill-snap Reflex : a Feeding Mechanism in the American Wood Stork". Nature. 199 (4892): 505–506. doi:10.1038/199505a0. ^ Dean, G. J. W. (June 1964). "Stork and egret as predators of the red locust in the Rukwa Valley outbreak area". Ostrich. 35 (2): 95–100. doi:10.1080/00306525.1964.9633490. ^ Kuramoto, T., Nishihara, H., Watanabe, M., and Okada, N. (2015). Determining the Position of Storks on the Phylogenetic Tree of Waterbirds by Retroposon Insertion Analysis. Genome Biology and Evolution, 7(12):3180-3189. doi:10.1093/gbe/evv213 PMID 26527652 PDF fulltext. ^ "Ciconia microscelis (African Woollyneck)". oldredlist.iucnredlist.org. Retrieved 2019-02-02. ^ "Storks (Ciconiidae)". www.hbw.com. Retrieved 2019-02-02. ^ Specimens BMNH 39741 (holotype, left proximal tarsometatarsus) and BMNH 39734 (right distal tibiotarsus). Similar to Ephippiorhynchus and Leptotilos, may be from a small female of Leptotilos falconeri, from L. dubius, or from another species: Louchart, Antoine; Vignaud, Patrick; Likius, Andossa; Brunet, Michel & White, Tim D. (2005). "A large extinct marabou stork in African Pliocene hominid sites, and a review of the fossil species of Leptoptilos" (PDF). Acta Palaeontologica Polonica. 50 (3): 549–563. ^ Distal radius of a mid-sized Ciconia or smallish Mycteria: Steadman, David W.; Arroyo-Cabrales, Joaquin; Johnson, Eileen & Guzman, A. Fabiola (1994). "New Information on the Late Pleistocene Birds from San Josecito Cave, Nuevo León, Mexico" (PDF). Condor. 96 (3): 577–589. doi:10.2307/1369460. JSTOR 1369460. 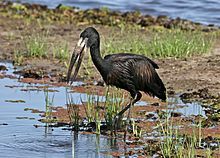 Look up Ciconiidae or stork in Wiktionary, the free dictionary. "Stork" . Encyclopædia Britannica (11th ed.). 1911. "Stork" . Collier's New Encyclopedia. 1921.